Personalised programmes for children with specific needs in the areas of social and emotional development, fine and gross motor skills development, speech and language development, cognitive, reasoning and self-help development. A plan of care for children who have complex needs in order to provide educational opportunities through communication and daily living skills at a functional level. For further information, click on the links below available for each programme. P.E.C.S. groups are limited to 8 children, along with our in-house trained and experienced therapists, teachers and assistants. This is to focus more on each individual child’s growing educational needs. All other specialised programmes are offered as one-to-one teaching or group of 8 children. Sessions are designed based on the child’s current level and discussions with parents. Prices vary based on child’s diagnosis and current level of evaluation. Developing communication skills through oral motor exercises, Augmentative and Alternative Communication to improve and strengthen receptive and expressive language and pragmatic skills along developmental lines. A UK born synthetic phonics approach that provides highly practical blending, segmenting and reading techniques through phonemic awareness. Numeracy knowledge using Numicon – An award winning programme that offers a robust and reliable assessment for mathematical conversation, reasoning and problem-solving. Picture Exchange Communication System is a non-verbal symbolic communication training. It is a form of augmentative communication intervention for children with autism spectrum disorder and related developmental disabilities. Staffs involved in the Phonics, Reading, Speech Therapy, Mathematics programme: Cristina, Sid, Reshmi. Download our Storypark, Programme Syllabus and Programme Routine brochures to learn more about the programme. Either drop in to our learning centre for a registration form, or download and fill in our registration form and send it to info@engagemindslearning.com. Once we receive your e-mail, we will call you to set up an appointment with us for a tour of the facilities, evaluation and schedule. Billing and payment will be due once registration is completed, and the rest is billed on a monthly basis. Give us a call at +6732672672 to set up an appointment with us, and our staff will gladly guide you through the registration process. Click the links above to know all the necessary information required to learn more about our programme in detail. If you are interested to enroll your child, feel free to reach us out through any of the contact methods below to set an appointment before coming to our learning centre. 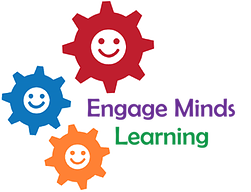 Engage Minds Learning is thrilled to inform you that we have begun our work towards Curiosity Approach accreditation and that from January 2019 we will be adding new philosophies to our learning environment. We are the first centre to take up the Curiosity Approach Accreditation and a proud one to work towards such high standards. There accreditation will take us 12 months to complete. We will be undergoing quite a few changes from opening some of the learning classrooms to form open learning spaces, to changes in the learning environments by creating wonder and curious activities and provocations to learning to changes among our teachers. There will no longer be teachers assigned to groups of children instead focus children will be observed by all staff and learning will happen across the setting. Data collection will help us keep the progress of the child at fingertips. We are aware that the children will be going into mainstream schools from the age of 6 ( the legal requirement with MOE) and so our target is to maintain the literacy and numeracy at our highest standards and have the children read well by the time they leave us , have a strong numeracy foundation but also be confident, curious and creative. For more information about The Curiosity Approach, click the button below.